I am sad too. Good luck Dan, we had some good talks, and fights. Thanks for all you have done. the team catches many who are looking for coins in the Negev area. In the case of the Bir Hadaj resident caught on Sunday, they were tipped off by a concerned citizen who called the police. Treasure hunters in the region are causing huge amounts of destruction. Fitoussi says the problem is getting worse. In Israel, they take preventing erosion of the archaeological record through artefact hunting and collecting a lot more seriously than Bonkers Britain. Guy Fitoussi, an officer in the Israel Antiquities Authority’s theft prevention unit said "antiquities robbers are stealing our history from our hands. The Israel Antiquities Authority and the Israel Police view any damage to the antiquities sites in Israel seriously and are working together to bring the perpetrators to justice”. (Amanda Borschel-Dan, 'Negev antiquities robber nabbed with trove of 150 Byzantine-era coins' Times of Israel 29 January 2018). But prevention is more efficient than cure. 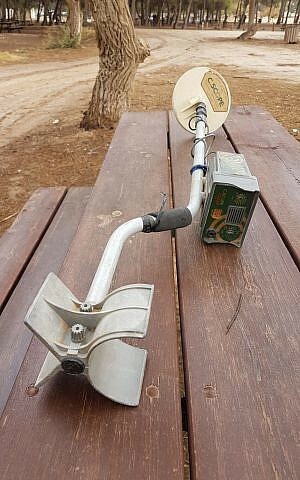 In Israel, owning a metal detector is not unlawful, but it is illegal to look for antiquities in any part of the country, use of a metal detector at an antiquities site is therefore a criminal offense in the State of Israel. According to Guy Fitoussi, an officer in the Israel Antiquities Authority’s theft prevention unit, it is even illegal to have a metal detector in your vehicle at antiquities sites. And in such a small country filled with antiquities, he said, “Even if you don’t mean to look for antiquities, you’ll probably stumble across them.” To combat the problem, Fitoussi said a team of volunteers keeps an eye on the sites and, perhaps more importantly, he gives periodic informative lectures at local schools. 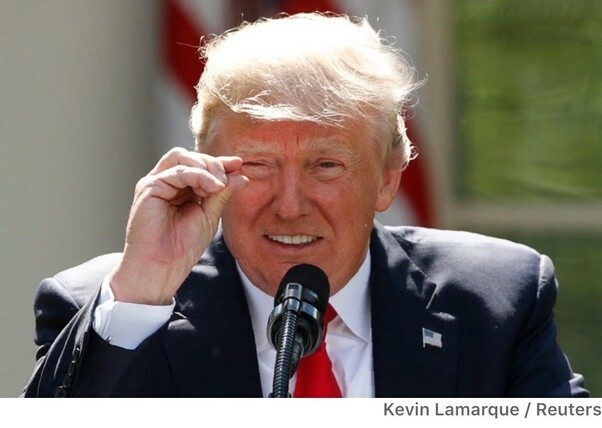 “Part of the problem stems from ignorance,” he said. Pupils have heard romantic stories about treasure hunts and easy wealth, so when they grow up they decide to try their luck. 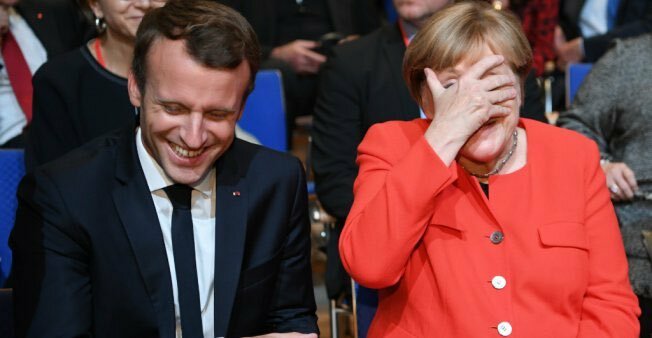 “Maybe it sounds a bit naive that if I go to a school and tell about the more academic and informative side, it will help the youth decide not to go do that when they grow up,” said Fitoussi. As far as those who say they have a metal detector for recreational reasons, Fitoussi quipped that in a country brimming with antiquities like Israel, it’s probably better not to take a chance. “There are lots of other hobbies around,” he said. Wouldn't it be great if in Britain, instead of the archaeological community popularising collection-driven exploitation of the archaeological record and artefact collecting among members of the British public (and abroad), there was some proper archaeological outreach, sending people out to schools, explaining why Treasure hunting is damaging. The very idea, eh? 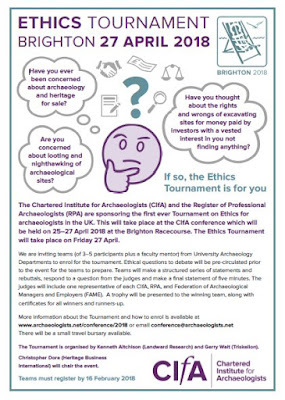 Archaeologists promoting archaeology instead of collecting. 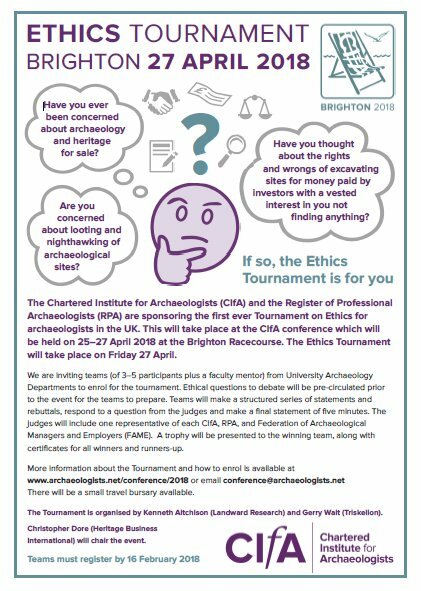 Deadline for entries for the CIfA Ethics Tournament in Brighton at #CIfA2018 is 16 February. 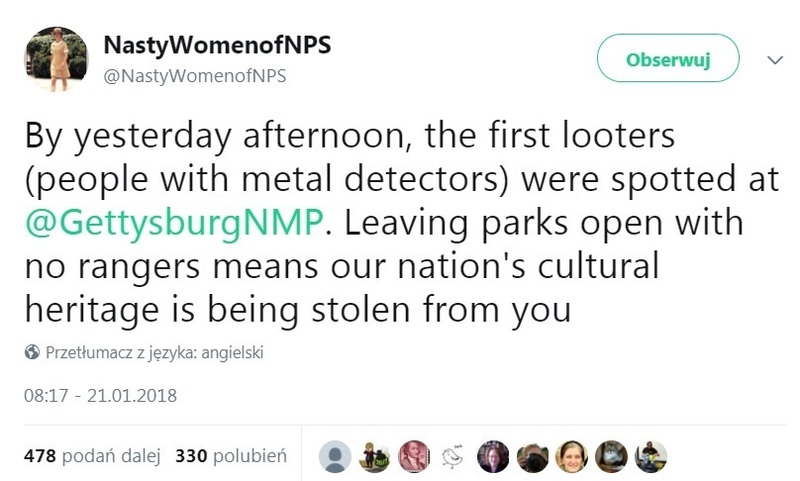 Define 'looting'. Do you mean collection-driven exploitation of the archaeological record or not? What kind of an 'ethics' question is it if not? Would it be ethical for the PAS to handle a collector's artefacts without seeing clear documentation awarding title of ownership to the finder? In the case of a treasure find, is it ethical to give a finder a reward, but expect archaeologists to recover knowledge of context without any such reward? Is it ethical for fieldworkers to agree to work under such conditions and in effect for an artefact hunter and collector? Is it ethical for data on collected items to only be available through a pay-to-view website? It has been reported that Murat Aksakallı, 50, who manages a cafe in the Scottish capital of Edinburgh, and his business partners Ali Sanal and Hakkı Özbey, have spoken with the officials of Sotheby’s and Bonhams auction houses in Edinburgh in order to find a buyer for the crown. Scottish police contacted the three Turks in 2010, pretending to be a buyer and seized the crown. When questioned, Aksakallı defended himself. 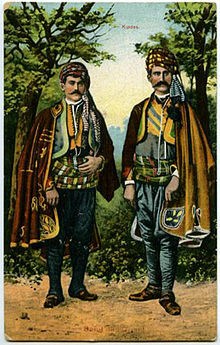 “I have inherited it from my grandfather, Fazıl Aksakallı, who died in Çemişgezek [a district in the eastern Tunceli province]. I had kept it for years and then forgot it. But I had decided to sell it when my carrier companies had financial trouble,” he said. The case later went to court. A Scotland court on Dec. 2, 2017 ordered the return of the crown to Turkey. 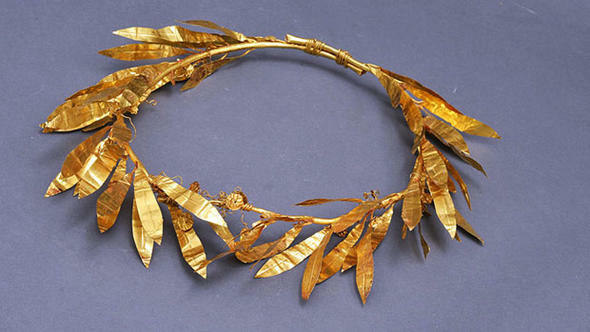 (Ömer Erbil, 'Gold crown of Hecatomnus returned to Turkey: Culture minister', Hurriyet Daily News January 28 2018 ) He claims to have 'kept it for years', but even then would hve required to sjhow an export licence for it when it was taken to England. His inability to provide one was the reason he lost possession of it. Collectors, keep all the paperwork! It is important in cases like this. Collectors: Adding to Our Knowledge of History? The problem is precisely that they are decontextualised artefacts of unknown collecting history (how did they enter the market and from where did they come?) in private ownership where proper analysis is impossible. They have been bought by a collector who considers that they themselves can be the judge of what is the reputability of their source, and that they themselves are uniquely-placed to 'understand' (through some kind of communion with the object) their significance and importance, and these are best 'preserved' through the display of the item in the context created by their collection. This is a characteristic of all collectors of historical and ethnographic artefacts, albeit Greek coins, Roman buckles, tribal masks. In this case, the self-deception and fallacy of these arguments are all the more obvious because almost all of the objects shown have the appearance of being modern products masquerading as ancient artefacts created with the intention for sale to precisely a collector looking for such artefacts to bolster (or on which to base) their personal vision of the past. By this means, through no-questions-asked acquisition strategies, false items are presented in the public domain and through various media as support for misleading pictures of that human past. The intellectual consequences of collecting were pointed out over two decades ago by Gill and Chippendale and yet the whole problem is still being ignored by the many supporters of artefact hunting and private collecting of artefacts in the academic world. If we are to use private collections as a source of information, surely we need to be taking a much more nuanced view than at present at what collectors collect, how they go about it and why. Than goes for Greek vases as much as metal detecting finds from muddy fields in Lincolnshire - or 'weird stuff' bought on eBay. VRBS ROMA, helmeted, mantled bust of Roma left. So, "South Lincolnshire" - wherever, has never been ploughed before? This coin has been in the ground some 1680 years and no plough has ever been near it, you say? And only now it needs "saving"? How come? Are you detecting on permanent pasture? W odpowiedzi do @PortantIssues @Andrewabp @caitlinrgreen It is from cultivated land that has been so for decades. From the condition of other coins from the site this is exceptional in that it hasn't been power harrowed or nuked with nitrates. Most archaeologists now acknowledge removing such finds from the disturbed stratum is rescue. Let us see if Mr 'Look-wot-I-have-found-for-my-collection' metal detectorist can respond with a proper argument that goes beyond repeating protective mantras. This is another red herring, the scatter of artefacts in most fields I have ever fieldwalked which derive from using farmyard midden material as manure (this being the sort of material that arttefact hunters would not b seeking for their collections - so would tend to ignore in their 'study of the history [of the site they are ripping apart]') indicates otherwise. > fell under the plough post war < yeah? So all those eighteenth and nineteenth century maps in the record offices are lying? 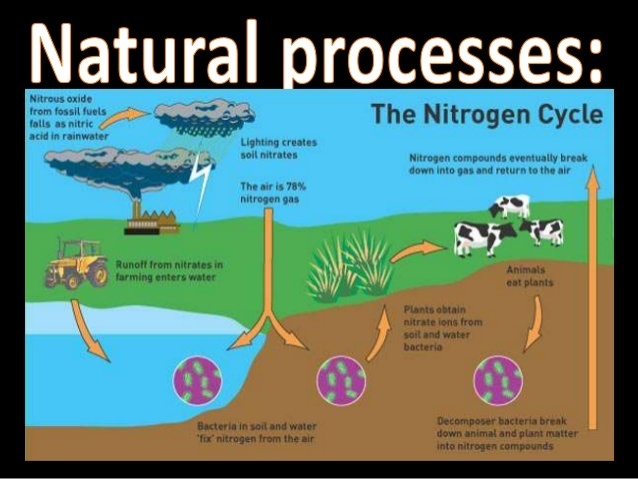 You miss my point about nitrates, did you read the link I included? In the States experiments are being carried out to train dogs to sniff out freshly-excavated artefacts being smuggled into the country. 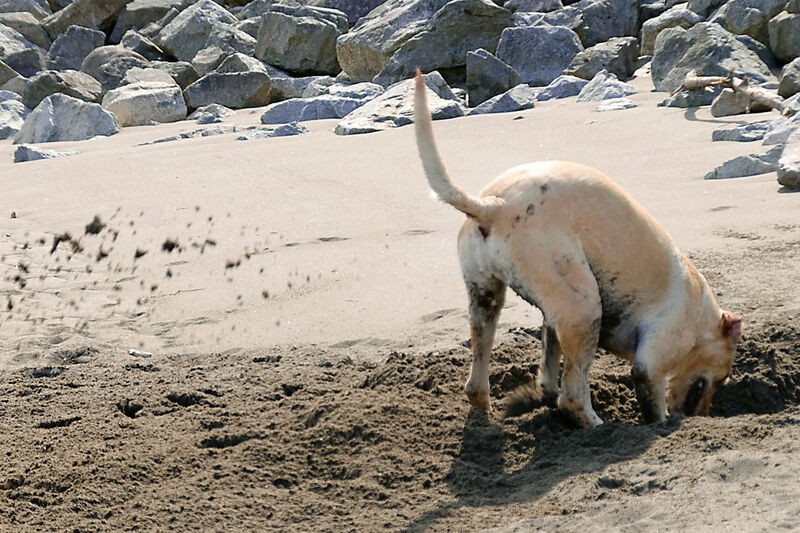 It seems that the PAS in Britain also employs canine help, this time in excavation of hoard sites. This is a PAS photo of their investigation of a hoard discovery site (Jack Brooke-Battersby, ' Bronze Age hoard found in Furness is treasure, rules coroner', 26th January 2018). 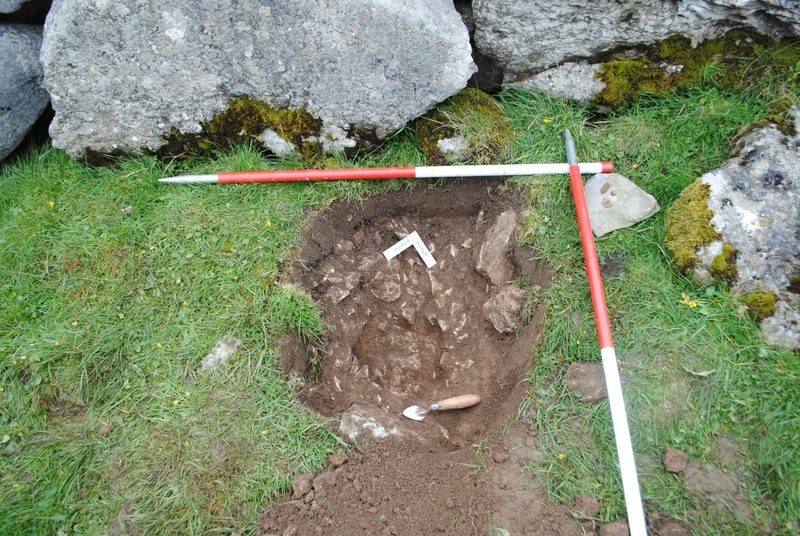 The photo shows that the artefacts were found at the base of a stone-free zone under permanent pasture right under the lee of an ancient structure of stones protruding from (see top right corner) that layer. In other words just the sort of search site the Revised Code of Practice which the PAS supposedly promotes says artefact hunters should be keeping away from. Since we know that the area around has a lot of arable land (see my Google Earth screenshot here) there is absolutely no excuse for this. The finder and the landowner, whose identity is protected under the Treasure Act, will receive an equal split of any payout made after the Valuation Committee reach a conclusion. Nonsense, the TA says nothing of the kind.Those boulders, are they part of a site shown on my Google Earth screenshot by any chance? 'They are usually buried in isolated high places and often in or near hillforts and other prehistoric features such as stone circles such as these were'. 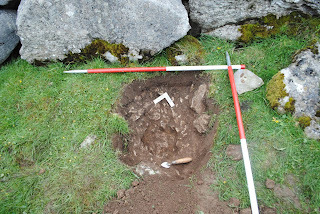 Investigation of the find spot has revealed that they appear to have been laid in a small hollow in silty clay sub-soil or directly on the prehistoric land surface in two small channels in the limestone bed rock and covered over with stones. The bracelet appears to be a part of the deposition as does the copper alloy cauldron fragment although this could have been residual in the soil. However it's direct proximity to the other objects means that is has to be and should be included in the hoard assemblage. In legal terms, but hardly archaeological. Such a small hole looking as if dug by a burrowing animal can tell us nothing. If the layer around contained other fragments of the cauldron, and it could be shown that the feature containing the other items were dug through it, we'd know more about this group of objects. As it is, we only have a bunch of "ifs". Totally unsatisfactory. The blog's owner is not going to discuss it, with a shoulder-shrug he remarks 'You have a choice, but not everyone would agree with you'. Not everybody? Beavis and Butthead probably agree it's a good idea, maybe. I doubt many more do when the PAS database is available for free to both finders and members of the public. What Kind of Documentation Should 'Responsibly' Metal Detected Finds Have? 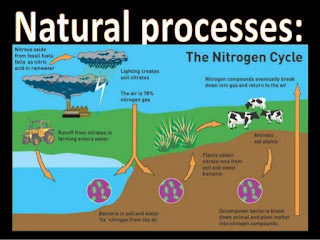 Heritage Action explain here ('Establishment STILL betraying farmers! ', 28/01/2018) their position regarding so-called 'finds agreements'. So far nobody in the pro-detecting Establishment has deigne3d to respond to the perfectly valid points they make (but, nothing new in that, these heritage professionals avoid discussion of the nitty-gritty of their support for Collection-Driven Exploitation of the Archaeological Record like the Plague). To the points they make, I'd add the other - raised here. Artefacts in private possession coming from another person's property should be legitimated (like those deposited in institutional collections as archaeological project archives) by being accompanied by a document relinquishing ownership. Otherwise how can one tell that they are not the products of illegal artefact hunting, or removed from the owner's property without their knowledge? Why are the PAS not insisting on such documentation for the artefacts they handle, and hold in their own offices while they are studying it? Why? 'The simultaneous raids at five locations over the last two weeks were launched after police units from the Department of Anti-Smuggling and Organized Crime received a tip. A total of 242 historical artifacts belonging to Sumerian, Assyrian, Byzantine, Seljuk, Ottoman and Hellenistic eras were confiscated. 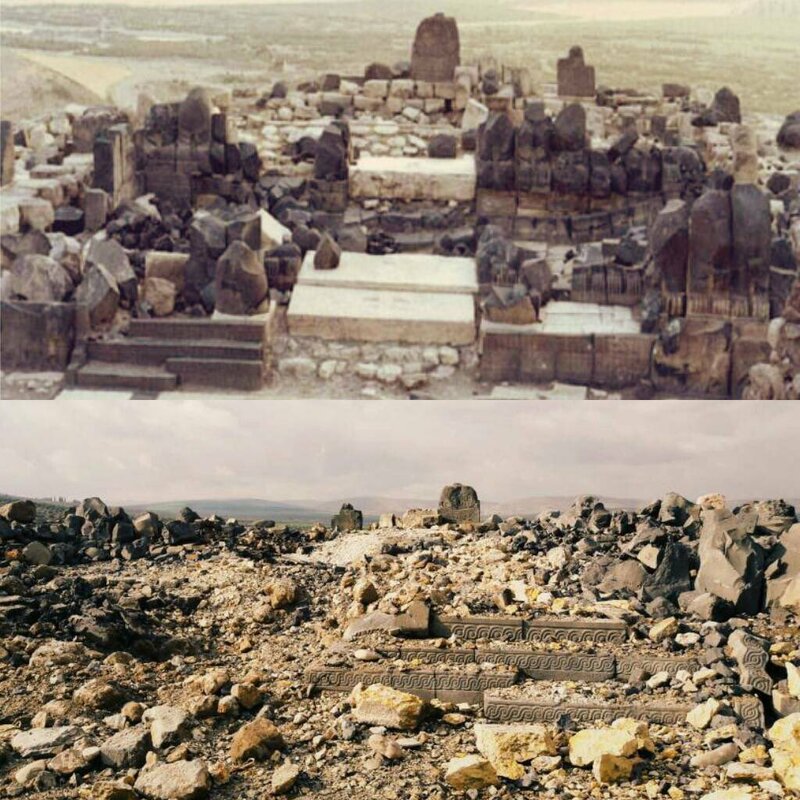 According to the police sources who spoke on the condition of anonymity, the Sumerian artifacts >were looted from an ancient tomb in Syria by PKK-affiliated PYD terrorists and were due to be smuggled to Europe to fund the terrorist group'. Istanbul police detained nine suspects who were trying to smuggle ancient Sumerian jewelry dating back 3,500-years, Assyrian and Akkadian seals, as well as Ottoman and Seljuk artifacts illegally obtained from the PKK-linked Democratic Union Party (PYD) and Daesh-controlled land in Syria and Iraq and use the proceedings for the PYD terrorist group, reports said Friday.[...] Artifacts confiscated in the operations include war equipment belonging to prominent commanders in the Seljuk Empire, including Afşin, Atsız, Artuk and Aksungur, 152 pieces of gold jewelry from the Sumerian Civilization dating back to 3,500 B.C., as well as seals from the Assyrian and Akkadian Empires [...] In addition, 78 artifacts from the Ottoman Empire and two artifacts from the Byzantine Empire [...] from the 8th century were also seized by the police.[...] The Mesopotamian artifacts were reportedly smuggled from Daesh-controlled lands, including Mosul and Babylonia in Iraq, Palmyra in Syria and other [sic] PYD-controlled lands. Both of these reports contain fanciful thinking. Very rarely are there follow-up reports to such articles, giving the basis for the original interpretations, we will see if there is a court case of nine men 'financing terrorism'. The Griffin Gallery (Gallery Center, Boca Raton) at its next monthly opening on April 4, 2002 will be featuring a newly acquired Gandharan gray schist frieze, dating to the 2nd century C.E. depicting a standing Buddha surrounded by four acolytes. The Buddha in typical Gandharan fashion, is wearing a flowing robe typical of earlier western, Greco Roman tradition. The Buddha's face, serenely and gracefully turned toward the acolytes, has features typical of Indian art. While Gandharan art still remains relatively affordable, it is evident that as the interest in this art continues to increase and the pieces become increasingly less available, prices will dramatically increase. While many of the artifacts now coming on the market are generally without provenance, careful comparison with known sculpture coming from Afghanistan and Pakistan leave little doubt as the authenticity of the pieces. If the majority of these pieces have entered the market less than 'a few years ago', what does it say that so many are 'generally without [collecting histories]' when the bulk of them would from what this dealer says be recent arrivals? After all, surely it is not just 'authenticity' that matters, but a verifiably licit source. No, Mr Biener? 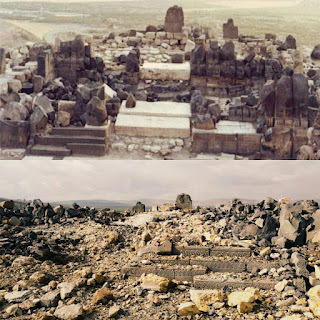 Ain Dara is a significant Syro-Hittite tell site with a temple complex in the northwest of Syria, near the Turkish border overlooking the Afrin Valley. Multiple sources are reporting that it was hit by a Turkish airstrike on Friday. This shows the temple courtyard before teh airstrike, and the lower what it looks like now. Friday Retrospect: What happened Here then? An online database for Danish detector finds has been launched at the National Museet. The project (project leader Dr Andres Dobat, archaeologist from Aarhus University, Denmark) is a joint initiative of several Danish museums which have come together to create a new database, where artefact hunters and others can register their finds. 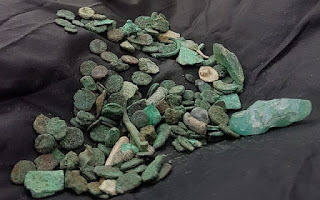 The database is called DIME – Digital Metal Finds ('Database created to register archaeological detectorist finds in Denmark', Archaeofeed). According to the creators, the purpose of the database is to get a better overview of the thousands of discoveries made each year in Denmark. The database will help both amateur and professional archaeologists and is expected to go online in 2017. Amateur finds are an untapped knowledge bank and organising them has been a challenge for museums as the institutions find it difficult to keep up with the sheer amount of discoveries. The number of finds is said to increase rapidly each year – the number of reported finds has doubled from 5,556 in 2013 to 9,756 in 2016. The database tries to introduce a new approach to handling these antiquities as the amateur archaeologists will be able to log the discoveries into the system themselves. argued that a user-driven national inventory of metal detector finds as the basis for research and dissemination is a precondition for the liberal model; and that, in the absence of such an inventory, metal detector finds are better off if they were left in the ground. Here, though most of the objects found come under so-called 'Danefæ' and are thus acquired by museums (so there is little scope for making private collections of archaeological objects), and the finder gets a market-value reward. The number of finds is relatively low compared to Britain and the annual budget required to purchase them is lower than in the UK. According to one metal detectorist, one of the main categories of objects handed in are 'Borgerkrigsmønter' (Civil war coins) issued by various emitters from 1241-1375. Perhaps this new database will change that. For some more thoughts on the Danish system see: Heritage Action, 'A bit more evidence the tanker is turning? ', 16/02/2011. Do you KNOW whose hands your ancient object has passed through? And do you Care? While a single, somewhat less than attractive not likely ancient artifact, recovered during a police raid in Italy, might not garner as much attention in the English media as say, an Etruscan vase seized from the Metropolitan Museum of Art, it still deserves a closer look. The bust, pictured above, deserves attention because if you dig a bit deeper than just reading a short headline of it being confiscated yesterday along with cocaine, a semiautomatic Beretta and a Colt revolver, you can begin to understand a sliver of the dynamics that sometimes come into play on the darker side of the illicit art market. A place where transactions can sometimes be furthered by violent criminals, in complete juxtaposition to the well-manicured, suit and tie wearing, art dealers who later launder illicit objects through some of the art market's finer art galleries. 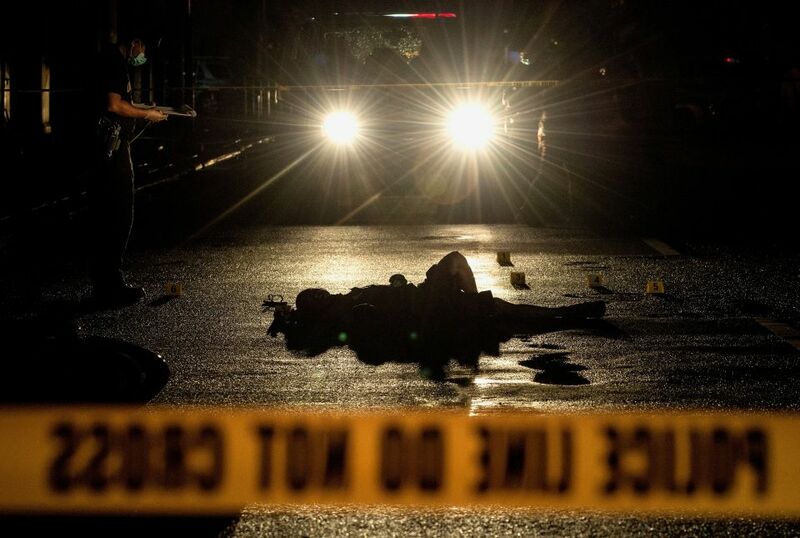 The seizure was made in connection with investigations into thirty-one individuals arrested on suspicion of affiliation with the Spada organized crime family. 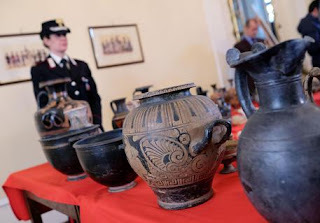 The links between antiquities smuggling networks and organized criminal groups have long seemed clear, and as more evidence comes to public knowledge, perhaps we should be asking all collectors, do you KNOW whose hands your ancient object has passed through? And do you care? We think you should. The vases and ceramics, dating to between the VI and the III centuries BC and worth over 300,000 euros, will shortly be put on public display, authorities said. So, how many British back bedrooms full of undocumented artefacts of unknown provenance will UK police be raiding as non-reporting metal detectorists pass away? What happens to the products of so-called 'responsible detecting' and the finds of 'nighthawks' when they die? Do they just end up indiscriminately mixed on the market? How can buyers ensure artefact bought on British market of portable antiquities ensure they are 'clean'? Let us recall that documenting transfer of ownership of portable antiquities from the landowner to the finder was one of the recommendations of the 'Nighthawking Report', what progress has been made putting it into action as part of 'best metal detecting practice' by the PAS and other supporters of 'responsible artefact collecting'? BBC 'Barrow Bronze Age gold hoard declared treasure' 24 January 2018 A hoard of Bronze Age jewellery unearthed in Cumbria by two metal detectorists John Rigg and Darren Fine has been declared treasure. The 3,000-year-old haul of three gold rings and a bracelet were found buried under a stone last year on a ridge at an undisclosed site in Urswick, Barrow. presumably therefore, they'd been hidden under the stone some 3000 years ago, and the deposit only disturbed by the Treasure hunters. Now, oddly enough, although the PAS are normally keen to bulk out their database numbers by adding Treasure finds to it, if you search under this place name, although there are other Bronze Age finds on the database from there this one seems not to be there. Why would that be? 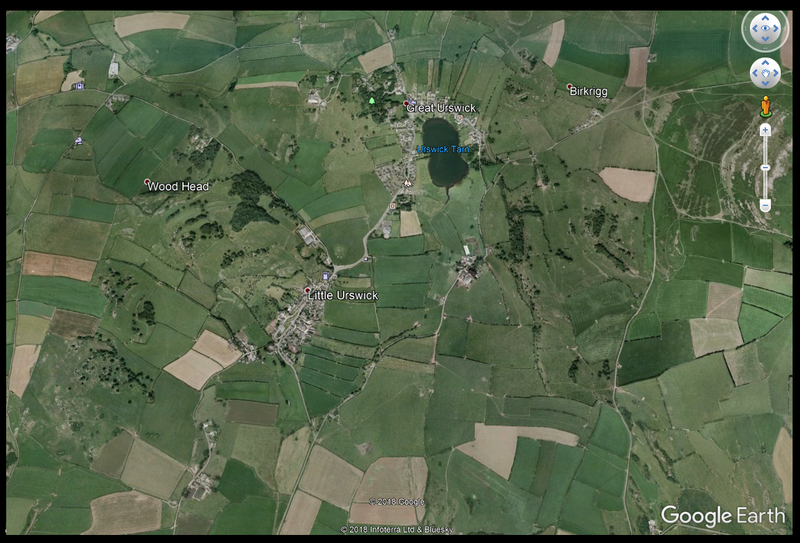 The other Bronze Age finds precisely from Urswick - are these all being removed from the same site? And is this site on cultivated land, or from the pasture areas with visible stones - some forming what look like structures, what does it mean 'on a ridge'? Earthwork? 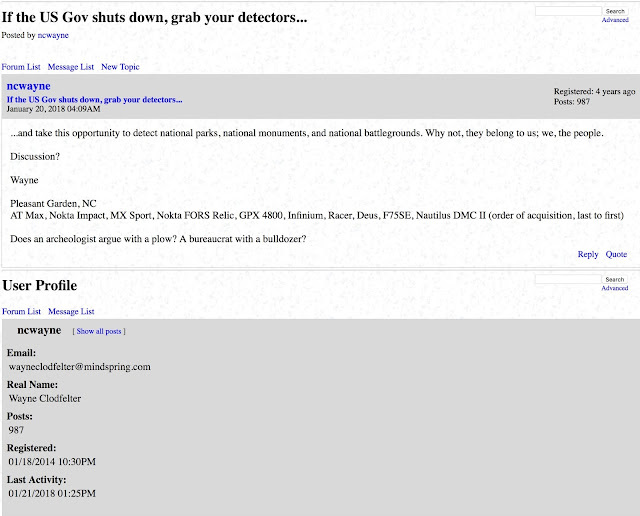 Do we have another case of targeting a known site? Vignette: The PAS and the media will show you the goldie goodies, Obviously from an archaeological rather than sensationalist point of view, what is important is the context, which will be somewhere in this area of the Google Earth picture. Sadly however, the Scheme set up to instil a notion of the importance of recording artefacts in their contexts, sic, gives no idea at all about any of that beyond 'a ridge at an undisclosed site in Urswick, Barrow'. Inaccessible for most private collectors: With X-ray CT imaging, experts at the British Museum were able to virtually strip back the clay envelope surrounding this Cuneiform tablet, allowing them to read text that hasn't been seen in over 4000 years - without damaging the artefact. 'the old guard, somewhat yellowed and musty, in archaeological circles, organizations and institutions fought tooth and nail against it... as they still do here in America. The sounds of tiny gnashing teeth, an amazing side job in hysterically dissing artifact and coin collectors, along with the infantile name-calling habit, are still heard in certain puddles [sic] of these folks who choose to live in the academic basement of archaeological origins [sic] and practices [...] They cannot understand (nor do some of them want to... hate and discord becomes a life choice, in some cases) that old ways of doing things are becoming extinct, and it is important, maybe even imperative, to initiate [sic] and embrace new ways to open doors into the future, and more importantly, new doors to the past [...] The lights are starting to change, and those who don't change with it are doomed to be left behind, crying their eyes out and stamping their feet. Tantrums do not make good science.' (Thursday, January 18, 2018) . The metal detecting community in England and some of the more enlightened practitioners of the actual art and science of real honest archaeology, as well as the British Museum no less, have come together to discover, document, recover, study, curate and display the neglected artifacts of an ancient age. And they are making fantastic inroads in mutual cooperation, as well as historic finds, with their marvelous Portable Antiquities Scheme or PAS for short. As a result, English history and the tangible remains thereof, have received a tremendous boost in popularity, with the citizens and certain savvy academics, sporting [sic] a newly renewed interest in the lives of those who lived thousands of years ago through their everyday objects and coinage.[...] I roundly applaud the enlightened and intelligent purveyors of the PAS, archaeologists and metal detectorists alike, and the amazing database of knowledge it has spawned [sic]. 'some 21st Century archaeologists, however, making use of the old adage 'work smarter, not harder!' have been turning to experienced metal detecting practitioners for help in racing the clock in recovering items being destroyed by chemical-based farming, road building, new structures and the like'. Another old saying[:] 'Old ways won't open new doors', seems to apply to those that seem to want to clutch at the old methods of doing archaeology, especially those who have lost sight of the goal of the supposed science, which was knowledge, not artifacts. Great post Jim. You nailed it. Our detractors seem to think that by doing away with the PAS we will all disappear. Well we will not and what will result is a loss of information for generations to come. a user-driven national inventory of metal detector finds as the basis for research and dissemination is a precondition for the liberal model; and that, in the absence of such an inventory, metal detector finds are better off if they were left in the ground. 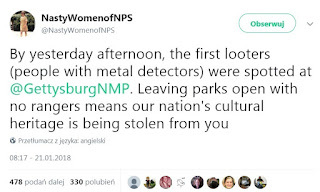 Artefact looters with metal detectorists a problem in Trump's America too. 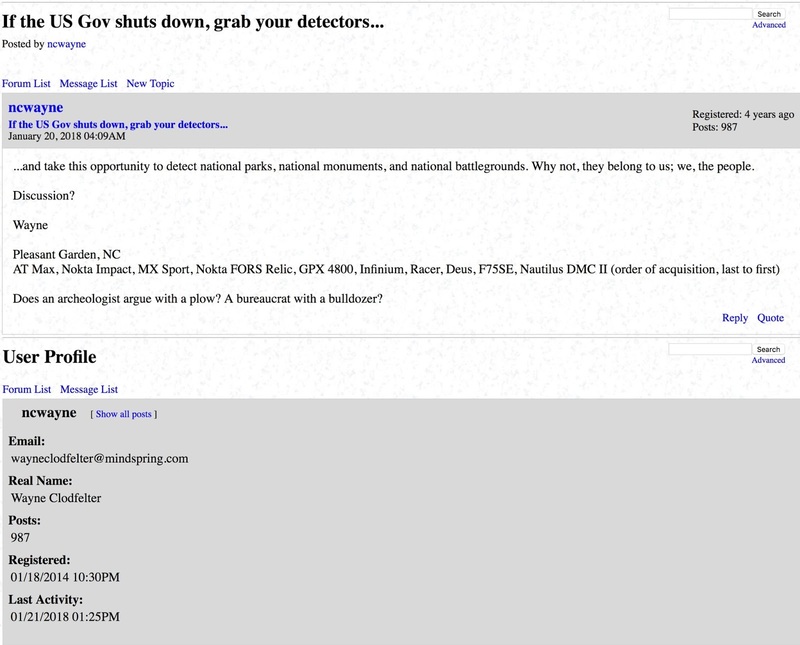 US Antiquities Trade lobbyists should be demanding that sites be guarded 24/7 there too. It seems Mr Clodfelter is a devotee of the argument that goes, 'if something belongs to everybody, it belongs to me, so I am entitled to take what is mine'. What are these people thinking? Have metal detectorists no shame? Meanwhile, there are severe reservations about moving the Bayeux Tapestry from the point of view of the state of preservation and conservation needs. This UKDFD creation can only do a lot of good for the hobby and metal detectorists in general. Being a hobbyist myself I hope government continues to enable the hobby to continue and be regulated as it is. [...] The UKDFD’s webpage will encourage metal detectorists to record finds of interest to the authorities and help finders of metalwork identify what they have dug up. Towns, villages, parishes, counties all over the UK will have instant access to a facility that provides up to date historical information about any area within the UK. Looking forward to viewing the UKDFD’s new site. I suspect Mr Micheal has confused the UKDFD (which has not up to now had a mapping facility) with the PAS, which has. I'd like to ask Mr Micheal who he thinks will be doing this 'mapping' with data that the people who have now seized control of them want to charge them to even look at them. I am also curious what purpose he thinks these maps would serve if the UKDFD database has 47000 objects and the PAS one (free to use) a much larger sample thirty times larger. John not being from the UK, but fascinated and intrigued to see what has been found, I think this idea is fantastic. I’m sure there is an awful lot of time and energy put into compiling these lists, maintaining these lists and investigating the artifacts found, so a pay per use only seems fair and logical to me. Thanks for bringing this to my attention, I’m going to head over to the UKDFD site and sign up. I have used this UKDFD site for years and found it invaluable for research when I first started detecting … and have missed it being available while update being carried out…. a lot of time and energy goes into running a site like this and it costs money when updates are required … I voluntarily donated in the past and am very happy to pay a small sum (approx the cost of one dig ) to be able to carry on using this facility. But the purpose of 'that facility' is to record items taken by the detecting community so that the other stakeholders (members of the British public and academics) can see what has been taken, that is the whole purpose of this record (as an alternative to the PAS). That is wholly negated by making every member of the public and every professional that wishes even to see what is there paying up in order to gain this 'privilege'. Mr Nettie may feel 'very happy to pay a small sum' to legitimize his exploitive hobby, whether non-collectors will be so 'happy' to pay-to-view the results is a wholly other matter, and the one that these self-centred cognitive orphans do not seem to even see. 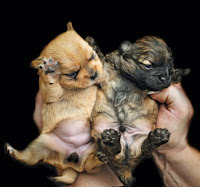 Looking at the timbre of the comments so far, I think really we do not need to bother what the sort of metal detectorists that are grouped around John Winter's blog 'think' about anything, the equally inarticulate puppies are more satisfying to watch as they slump around aimlessly in their own cocoon of entitlement. "Responsibility" in words, and then the Sad Reality About Literacy. Oh, oh, isn't their that aaaa, you no, woss it called? 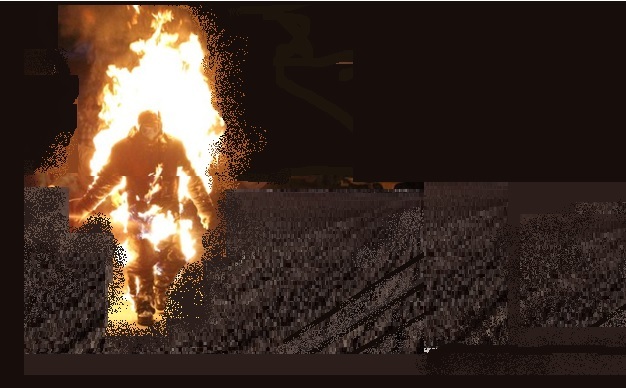 You no, that Codey fing... the Code of, of..., um, Responsible... yeah, thass it, Responsible Metaldetecting! Woss that say then? Bury it and hope nobody hits it when hoeing the spuds next year? Gor Blimey! Is this Really a 'Way Forward'?